What is the metal hot working? The ultimate goal of metal hot working is to produce metal components of the required structural orientation and geometrical shape. Both hot and cold working methods are employed to work the metal. However, hot working is different from cold working in the way that the end product of hot working is more ductile and less hard. No internal stresses are set up in metal during hot working in contrast with the cold working process. The process of metal hot working constitutes plastic deformation under high temperature (above the re-crystallization point of metal). The re-crystallization occurs simultaneously along with the deformation during hot working of metals. Recrystallization is the phenomenon occurred at sufficiently higher temperatures, where the growth of new grains in the metal structure, is accelerated and resulting metal comprises entirely of only new grains. The hot working temperature of metal depends upon re-crystallization temperature of that metal, for instance, carbon steel requires temperature greater than 1000 ᵒC (1832 ᵒF) for hot working. 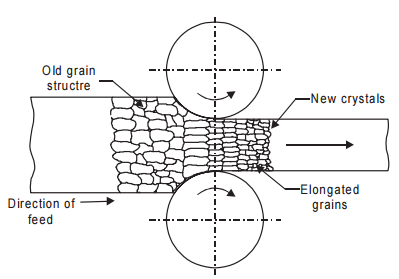 During hot metal working, distorted grain structure and strain hardening produced by deformations are rapidly eliminated due to the formation of new strain-free grain (a result of recrystallization). The maximum temperature of the hot working of metal is set 50 °C below its melting point. If metal is worked at or near melting point temperature, it will crumble into pieces during deformation (known as hot shortness). The metal hot working operations are carried out in the number of simultaneous steps. In the first step, metal is heated to recrystallization temperature. Afterward, the intermediate temperatures (hot working) and finishing temperatures are set to obtain a product of containing the maximum number of fine grain size. The finishing temperature is kept just above the recrystallization temperature of metal and deformation produced in the last step is relatively large to maintain a fine recrystallized grain size. The application of hot metal working includes hot rolling, forging, extrusion and hot drawing. The carbon steel and stainless steel products are rolled to form thin plates and extruded to produce desired shapes. Hot working is used for altering the form of iron and steel without fracture and use of excessive force. The advantage of hot working is that it does not produce strain hardening; therefore there is no increase in hardness and yield strength. Hot rolling is the most efficient method of forming metals into sheets and plates by plastic deformation using compressive stresses by two rollers or more in series, compressing the metal to desired thickness. It is used in the manufacturing of sheets, rails, structural sections, and plates, etc. Hot rolling, in contrast to cold rolling, retains the ductility of the final product. Hot rolling is carried out at typically high temperatures of 950-1000 °C (1742-1832 °F). The surface of hot worked metal oxidizes in air, resulting in scale formation and poorly finished surface. The hot rolled product is further treated (pickled) and cold rolled to ensure a better surface finish. The following represents the metal hot working (rolling) process. Forging is one of the oldest methods of working and can be done in hot, warm and cold modes. However, hot forging is most common. During hot forging the metal is deformed plastically at elevated temperatures (above recrystallization temperature) into desired shapes by application of successive blows or continuous squeezing. Forging is further classified into closed-die forging and open die forging. In closed die forging the hot metal is compressed between two or more die halves to obtain the desired shape. The metal flows plastically into the cavities formed inside the die and adapts the shape of the die. The machinery used during hot forging includes hydraulic presses and mechanical presses. Contrarily, in open hot forging, the deformation in shape is achieved by relative movement of the workpiece to the die sections. The open die can produce spindles, hollow cylinders, washers in addition to basic shape (round, square, hexagonal bars, etc.) products. Automatic hot forging offers an efficient mass production of parts. The production rates vary from 180 to 200 parts per minute for steel bars as long as 7 meters. During automatic hot forging the hot rolled steels are heated to 1200 °C (2192 °F) in 60 seconds using high power induction coils. Hot extrusion one of metal hot working process is carried out above the material’s recrystallization temperature (1200 °C/ 2192 °F) to keep it from work hardening on cooling. The process can produce long straight metal parts of various cross-sections and shapes such as round, rectangular, L-shape, T-shape and tubes, etc. During the hot extrusion process, the bar or metal is forced to pass through an enclosed cavity using compressive force. The pressure ranges from 30-700 MPa (4400-101,500 psi).